Ntrca Vacant Post. 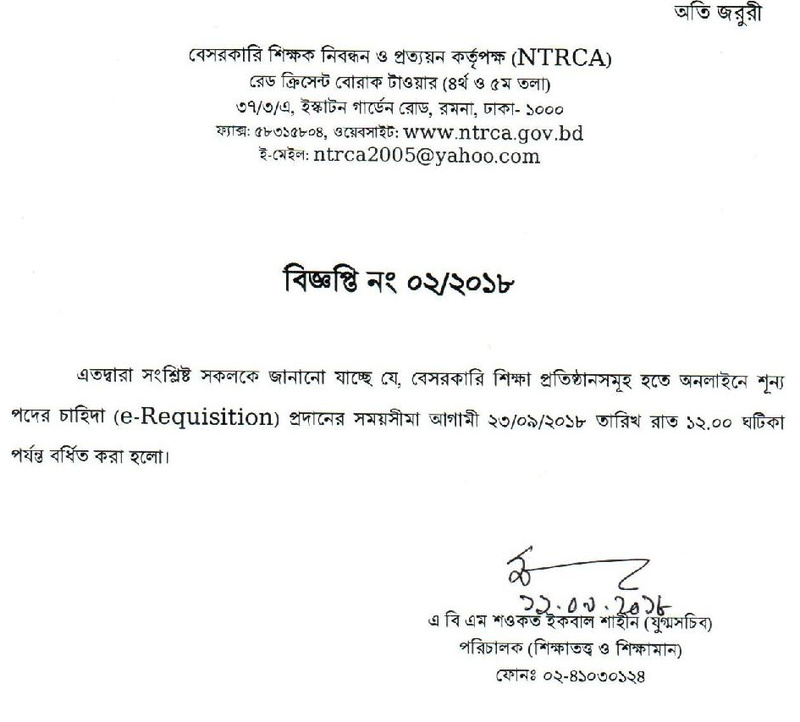 NTRCA Teacher Final Requirement Registration time has been extended. Online Apply Registration Can be 23/09/ 2018 has been announced. NTRCA Author announces that 1st to the 14th candidate vacant list is can apply before 23 September 2018. Non-Government Authority has been requesting this circular. We also will be published this applied result, posting date, posting is and more update information. Now we have given bellow this details. We also will be published 15th Ntrca Result 2019, 15th Ntrca Circular and more updated post by this page. NTRCA Teacher Final Requirement Notice Online ApplyNon-Government Teacher,s Final Requirement Notice circular first to twelve exam success candidate will be applying this final requirement. So if you are a candidate those examine you can apply here. Most important are given for NTRCA Teacher Final Requirement Notice Online Apply. We hope if you are a candidate in 1 to 14th NTRCA Passed candidate you can get a good change for join any institute. We hope after apply you can see circular carefully. Soon will be published this vacant post online apply. When will be published this online apply same time you can aply this post by this page. We have given all information by this page. NTRCA Teacher Final Requirement Notice Online Apply will have Complied online. We are given bellow you can apply there. 1 to 14th Ntrca Vacant Post Online apply will be start soon. After completion, this apply we given this exam result by tis page. We are given this final jobs information Notice But if you miss any information please send me your idea our comment box. We also published all Bangladesh government jobs circular result admission and all kind of educational information. You can get all update information from this website. We also published this information on our Facebook fan page you can like our Facebook and all the information on your Facebook profile. Thanking to visit our website. We are giving all the exam result here.